Please join us for a walking tour and ice cream social by meeting up at Jane’s Carousel at 6:3pm. The exhibition is up all summer long if you miss the unveiling, but you will miss out on the free ice cream. I’m making a shameless plea to please cast your vote my project for the People’s Choice Award here. They have cool prizes I wouldn’t mind winning! …Just saying. 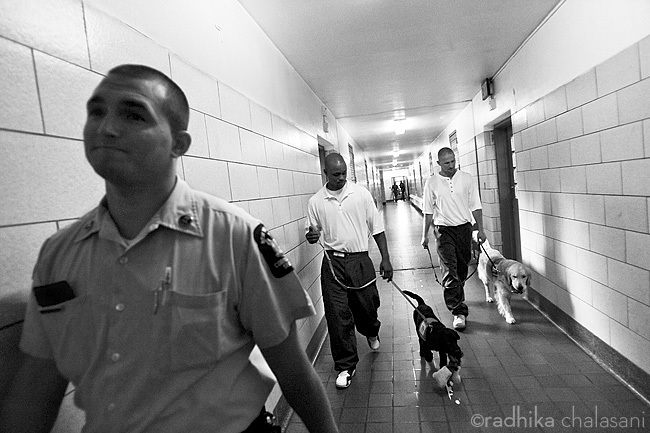 I was given permission to visit Fishkill Correctional Facility to document the Puppies Behind Bars program. 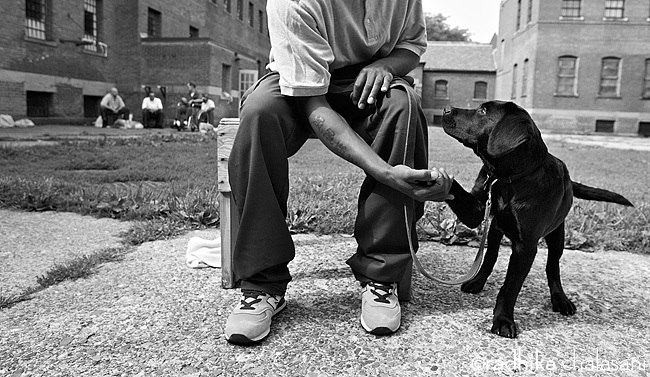 With only one day access to this medium security prison, and with 22 prisoners and their puppies to photograph, I had to dive right in to the assignment to quickly identify who to focus the story on. That can be challenging with a large group and no heads up about the individuals in the program and their backstory. 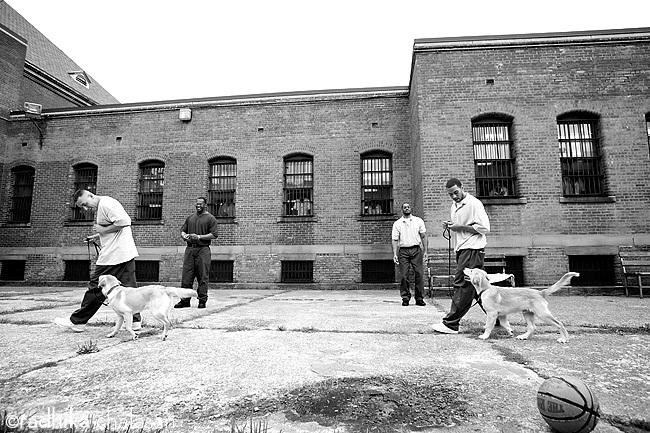 Fishkill Prison wasn’t visually what we expect prisons to look like thanks to tv and movies; the prisoners weren’t required to wear uniforms (except for the olive green pants) and, at least in the area the puppies resided, there were no iron bars on the prison ‘cells’. I couldn’t photograph the outside perimeter and other things for security reasons. The visual cues we look for as photographers to set the scene and give a story a sense of place were a little harder to come by as a result. Not true for Oprah, though, since when they filmed at the prison after my visit, Albany directed all the prisoners to be in uniform for tv (enhanced reality). One of the things I love about self-assigned projects is that I can change my approach and my storyline on the ground to suit the actual situation I’m in. It isn’t a top down situation, where the story has been laid out by a publication or an editor and it can sometimes be difficult to diverge from the expected story angle. I can’t tell you how many times over the years I’ve researched a story thoroughly, gotten on a plane to shoot, only to find that things aren’t quite what I expected. 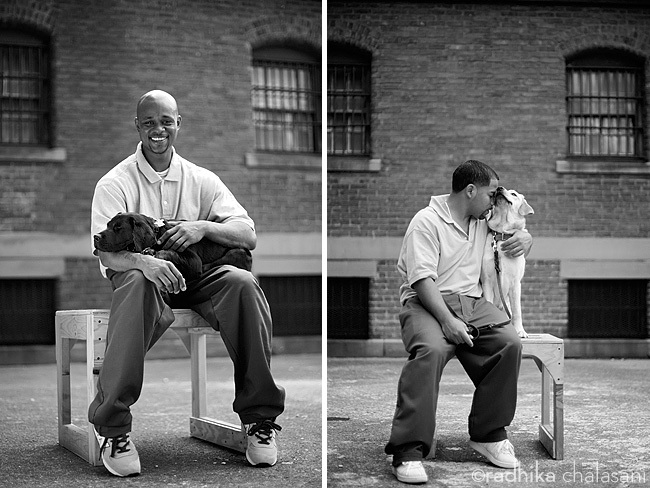 After my one-day shoot, PBB asked me to do portraits of the prisoners and the puppies for their annual calendar, so I was lucky enough to get a second day in the prison. I had two hours for all 22 prisoners and their dogs. It was one of my most memorable shoots. I’ve photographed animals a lot (puppies, giraffes, elephants…hey, I lived in Africa). I think what works is when you can show them with people-like reactions and emotions. I ended up enlisting two prisoners as photo assistants—one with a chew toy and another with a reflector. As I was taking the portraits I quickly realized these photos were all about showing the connection between trainer and dog and their feelings read loud and clear to me. When I looked at the images later, I felt the portraits told a better story in many ways than my documentary images did. I knew nothing about the prisoners personally except for a couple I’d originally profiled because there was no time to interview them. I typed up a list of questions that I would’ve normally asked in person and sent it to the PBB instructor. I wasn’t sure I’d get any answers and was surprised when I received a very thick envelope back in the mail. Every prisoner took the time to write long, thoughtful answers. They weren’t obligated to tell me why they were in prison, but most did (some for murder), and many were very open with their emotions and the impact the dogs made on their lives. The full set of images with the captions that include their words can be seen here. I’ve done many stories over my 20-year plus career. Often the happy, feel good stories aren’t quite as perfect as they sound. This was one of those rare situations that there seemed no downside, and the program accomplished what it was designed to do. It helped reform the prisoners, give them hope and self-esteem, and a way to redeem themselves. It helped society because these prisoners had more of a chance of getting out on the street to be productive citizens. It helped the people who received the dogs. Win-win. So nice when that happens! Subscribe to comments with RSS or TrackBack to 'Puppies Behind Bars – The Fence, Brooklyn Bridge Park'. Radhika! It’s been so long! What a great story. Glad to see you are doing well. Much luck to you with the show. Way too long! Glad you like the images! Great pics.. You have my vote.. if it counts.. Good luck! !